History/Legend of the Clan: A legend of the clan states that the first member was a medical nin who when messing with his chakra control in a lab, where he was experimenting with acid as well, with his hands full with chakra, he tripped and his hands hit a tub of acid. His hands were covered in acid, though the chakra immediatly somehow soaked up the acid, and therefore releasing a acidic chakra affinity, to his existing lightening and water affinity. When he started using the acidic jutsu, he tried to show others how to gain it, though many who tried died, the acid didnt work along with there chakra affinities. The acid in the lab was made by water and electricity to make a low grade acidic substance, though when used in jutsus of a user, it was put more corrosive. Few medical nins that had lightening and water tried, but died, it was only for some reason that this medical nin was able to do it. After this incident the acidic chitaiga clan was created when he continued to have kids, and so on. Some way down the clan a man moved mated with an sharingan user thus releasing the corroding eye, though others that were related to that user, took a while to unleash the corroding eye. Later at adulthood by the son of the first user, there was the unleashing of the Kalleidoscope Corroding eye which corrodes the body slowley but gives u unlimited acid release techniques without the use of hand signs. Though now hundreds of years later the Corroding Eye is unleashed at genin level, and is now relied on to be used for acid release jutsu, and detecting ph levels, while the kalleidoscope corroding eye has the same use. Clan Powers and Summonings: The clan can summon Komodo Dragons that instead of bacteria filled mouths, they have acidic mouths. The Corroding Eye is released at genin level and used to master acid release without even learning lightening or water affinitys, the corroding eye is sometimes only present in a certain number of people considering it was started on one side of a branch. The Kalleidoscope Corroding eye will be released when the most advanced acid release jutsus are mastered. The corroding eye gives you every acid release jutsu and lets you do it without hand signs, though when you use the kalleidoscope corroding eye, it corrodes your body very slowely. You can use it forever, though it drains small ammounts of chakra, but forever, so you must replenish your chakra unless you will get sucked dry. Members who have a high ammount of chakra are great with the kalleidoscope corroding eye. Description: The caster does many hand signs to build up chakra within the hands. Than the caster has a puddle form in front of them that continues and continues faster and faster until it swarms around the opponent, usually in escapable, though if you are S rank you may have a chance to escape. The acidic water creates pits slowly into the ground, as the acid rises the holes get deeper and you will be eventually corroded. The ocean is big, but is only 100 feet across, 100 ft long, and gets deeper 3 feet per minute until it reaches 90 ft deep, the jutsu is dispelled or the person who the caster is facing dies. 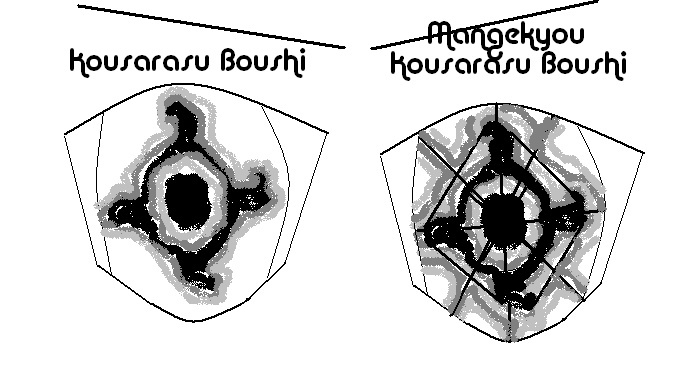 Description: This jutsu is only able to be used with the kalleidoscope corroding eye. When you build up chakra in your eyes with the kallodoscoppe Corroding Eye already activated, you can focus on an objective, and a vortex of acid comes from your eye and swarms around the opponent. Description: You gather chakra at the feat and do many hand signs. Than acid comes from your feet and goes onto a spot and creates the ground to become week under certain spots and when you fall in you fall into a long hole. This jutsu is used for traps. Description: You run the acid release chakra through the kunai or other ninja weapons, and when it hits its target, it corrodes the object it hits, unless the kunai is tooken out. Description: You do many hand signs to build up chakra. When you do acidic rain appears over an opponent and burns and irratates the opponents skins and slowly corrodes there body. It covers an 20 yard radius of the person being attacked. Description: After series of hand signs a shield of corrosive acid, without touching the user, appears before the user and can deteriate anything that hits it. Description: You use a series of hand signs to use acid to create a clone which when hit with kunai, the kunai detiorates, though can be dispelled by a wind attack. Description: You do many hand signs to create acidic spout of water that turns into a dragon similar to water dragon jutsu. The Chitaiga clan originate from the former land of rice (land of sound) and were the primary protectors of the land from invading lands because of their unique Acid Release that brutally ate away their enemies untill their was nothing left. The Chitaiga clan also were the primary police force of the land, keeping peace strictly but fairly and were even given permission to create a hidden village by the rice daiymo but declined. A while back the rouge nin orochimaru invaded the land of rice and all but wiped out the chitaiga clan causing all of those that were left to flee to surrounding nations and villages as refugee\'s. The Chitaiga clan has created to new clan houses one in kirigakure and one in Konohagakure, though continued to spread out throughout the nations. After the explosion very few survived, there is a small clan house, though not located in any village, it is a small little hidden place with a couple chitaiga members, and family. Jastro Chitaiga is only the current child that is enrolled into the ninja acadamy because most of the people avoid violence after the destruction of the old world. Clan Member Appearence: The clan members that are old may wear bandages for there unleashing of the Corroding Eye, though usually the members dress normally. How big of an area does the acid rain cover? 20 Yard radius in all directions of the person being attacked.